Why has this little girl lost her luscious locks? Posted on 12 June 2012, in Uncategorized and tagged Central Queensland, conservation, photography, portrait. Bookmark the permalink. 2 Comments. Sadly, I think the poor lass’s damaged locks are the result of poor storage conditions. Without examing her in person, it is difficult to accurately diagnose the cause but I can suggest a number of possible causes, both climate related. Severe dessication (drying out) of gelatine photographic emulsions often occur in climates that have long spells of dry weather or seasonal extremes in humidity. Gelatine is very sensitive to changes in humidity. It swells in humid conditions and contracts when the air is dry. If a photograph has been handcoloured, flaking can be more severe in areas where less hand colouring has been applied. The colour layer can act as a protective layer over the gelatine. Another possibility is that the paint applied on the young lass’s hair reacted with the emulsion, causing the drying out of the gelatine. 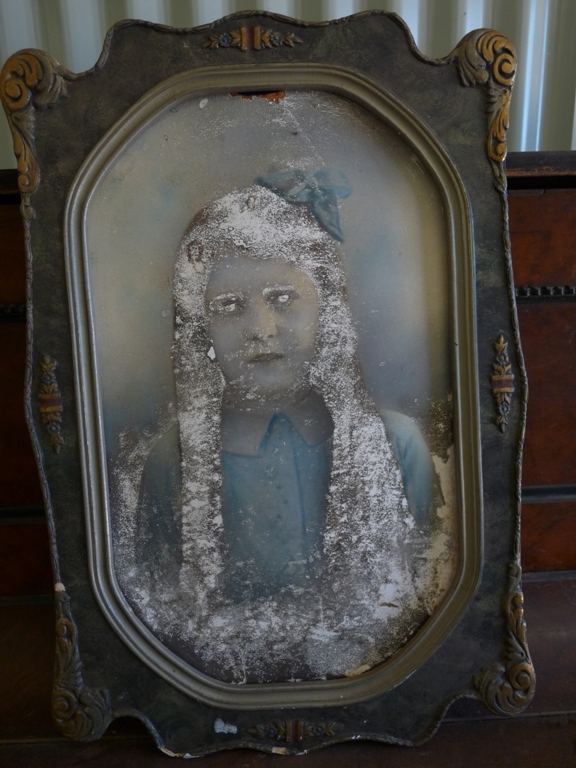 If you have important photographs suffering from the same tragic fate as this poor girl, seek the assistance of a qualified photograph conservator as treatment of emulsion dessication is very difficult and must be done with extreme care. To find a conservator see AICCM’s website http://www.aiccm.org.au. Thanks Lydia, I find it fascinating that it is just her hair and eyes which copped most of the degredation.